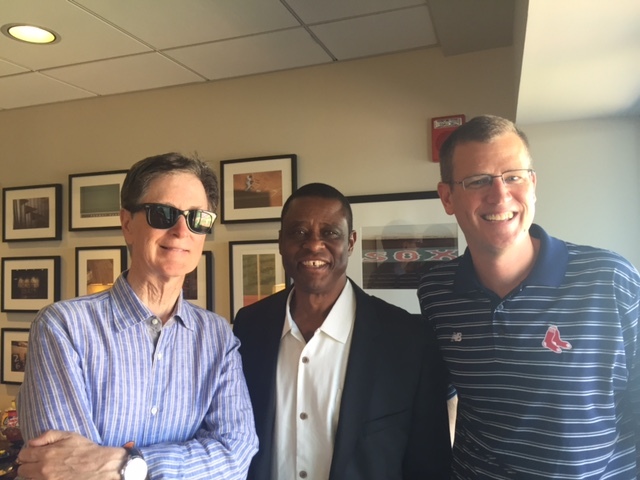 Montreal, September 8, 2015 - On Monday September 7, Montreal Baseball Project founder and president Warren Cromartie travelled to Boston to meet with key members of the Red Sox organization, including owner John Henry, Executive Vice-President and Chief Operating Officer Sam Kennedy and President of Baseball Operations Dave Dombrowski. "It was great to meet with the three of them and to speak about what we have accomplished here in Montreal, in our quest to bring Major League Baseball back to the city," said Cromartie. "They were well aware of our efforts and the tremendous support there is throughout the baseball world for what we have set out to do." Cromartie was also invited on Red Sox radio to talk about the groundswell of support for baseball in Montreal. "I was particularly pleased to hear from them how much support there is for the return of baseball to Montreal in the Boston area, and how there is a strong overlap between the fan bases of both cities. I saw many fans wearing Expos hats and jerseys. I look forward to the day when the Boston Red Sox come to Montreal for a Major League baseball game." The Montreal Baseball Project is an organization founded with the objective of bringing a Major League Baseball back team to Montreal. The city has a rich baseball history that included being the catalyst for Jackie Robinson breaking the color barrier in Major League Baseball, and with a regional population of close to 4 million people, it is currently the largest North American city without a baseball franchise. Montreal Baseball Project seeks to build upon the recent groundswell of demand for baseball in Montreal and deliver a team back to the community. Photo : John Henry, Warren Cromartie, Sam Kennedy.